Joy Division‘s eponymous debut album, Unknown Pleasures, came out in 1980 and therefore Peter Hook, bass player and I am beginning to assume primary song writer, decided to throw a 30 year anniversary tour to commemorate the album. This small Unknown Pleasures revisited tour featured a backing band whose members very likely weren’t born at the time of the album’s release with Hook taking the vocal duties long vacated by Ian Curtis. 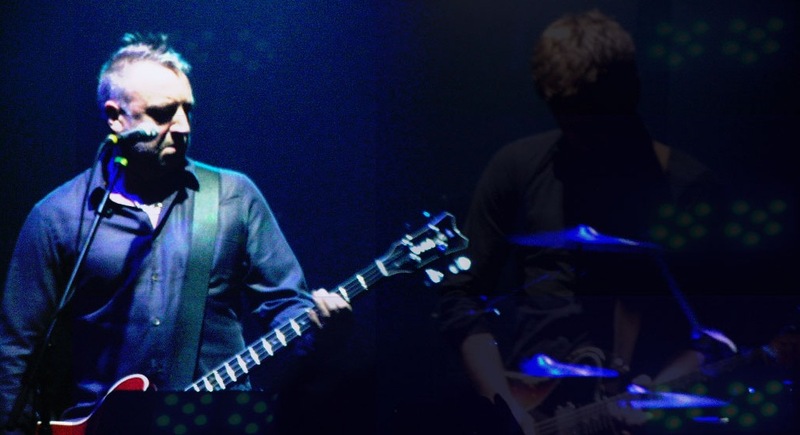 You heard me right, Peter Hook, Joy Division bassist, taking on the vocal duties. Needless to say, no other former member of Joy Division was involved. I suspect they thought exactly what you are likely thinking right now; “this sounds like a very bad idea”. I bet Peter, now well into his 50s, hatched this ideas just about the time that he thought it would be a good idea to buy a motorcycle, if you know what I mean. It seems that back in the late 70s when Joy Division was formed, a teenage Peter Hook was simply hoping to join a rawkus testosterone fueled punk rock band. The early Joy Division singles met that description but with the talents of producer Martin Hannett and vocalist Ian Cutis along with the other band members, Joy Division quickly evolved into an icy post-punk band whose success and brilliance swept up Peter Hook and thereby trumped his idea of joining a little punk band. Before he knew it, after the suicide of Ian Curtis, Peter and the remaining members were trying to move on and quickly found immediate and massive success in defining keyboard-based dance new wave with New Order – again his rock ‘jones’ would have to wait. My guess is, and this is pure unsubstantiated and utterly unresearched speculation, that 30 years on, after all of the dust of decades of involvement in successful and wildly transformative bands, he realized in his mid-life crisis that all he really wanted to do was grow a faux hawk, pump his fist in the air, and rock out with one foot on the monitor. And that is pretty much what he did for this show. In sum, I suspect what this particular tour was about reliving why he might have joined a band in the first place. As far as I am aware, this is the first time I have heard Peter Hook take on vocals in any band, yet his voice is shredded as if he spent 30 years being a chain-smoking Johnny Rotten, not the bass player for two subdued New Wave bands. Did Peter Hook shred his voice over the past 30 years screaming in the shower the Joy Division and New Order songs as pub screamers as he always hoped and envisioned they would be? Peter Hook made no effort (thankfully) of acting or sounding like Ian Curtis and reinterpreted the songs as loud guitar rock along with his thumping base lines taking lead and with synthesizers taking a conspicuous backseat. I can’t say to what an extent this undertaking was a success or not, but it made for an interesting night out. Here is Peter Hook, doing as part of the encore Joy Division’s final released single “Atmosphere”. Your thoughts? Inspired or Insipid? Ya know, I have a bad habit of not posting the track thet reinforces the point I am trying to make in the post. Not only is “Atmosphere” not on Unknown Pleasures, it doesn’t make for a particularly good example of Peter Hook ‘pub-rockin’ a JD song. I posted it because “Atmosphere” is my fav JD song and no one – and I mean no one – in their right mind would try to cover it, but low and behold, Peter Hook gives it a go. All things considered, not too bad. It is a pretty subdued mellow take. Sure beats the unholiness of Nouvelle Vague butchering “Love Will Tear Us Apart” live replete with mic to the audience crowd participation. [shutter] That was truly awful.